As a member of the Joint Committee on Foreign Affairs I try to have an active role in finding the best stance for Ireland to take on international issues. I have a strong interest in conflict prevention, resolution and reconciliation and consider it a privilege to be in a position to influence national policy on these areas. 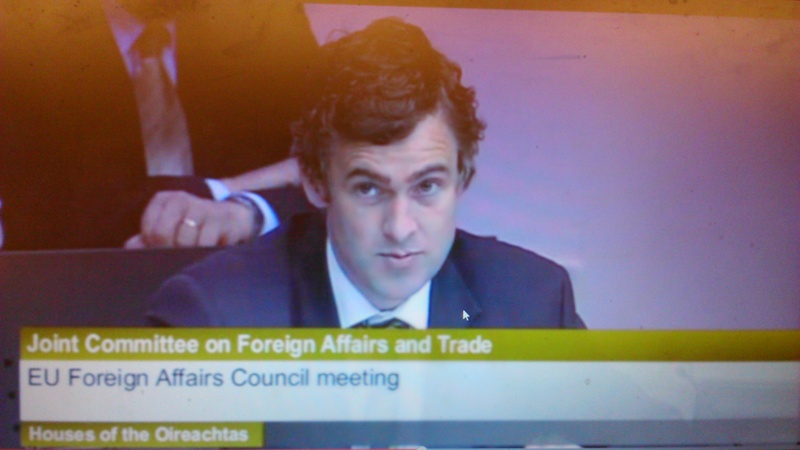 In the 23rd Seanad, I was on the Sub-Committee of Human Rights; my role as Spokesperson for the Irish Overseas and Diaspora strengthened my contributions to this committee. The Sub-Committee was established to consider all aspects of international human rights, including the role of the United Nations in this field. Ibrahim Halawa’s solicitors have said that Law 140 can be used to free the young Irish man and has already been used to free Australian Peter Greste, who was Ibrahim’s former cell-mate. Below is a letter I have received from Peter Greste reiterating that the decree explicitly gives President Sisi the authority to remove a foreign national “to complete the judicial process” in his country of origin and could be used for Ibrahim as it was for him. At my request, the Foreign Affairs Committee has invited Amnesty International to a meeting to discuss the detention of Irish-born Ibrahim Halawa. 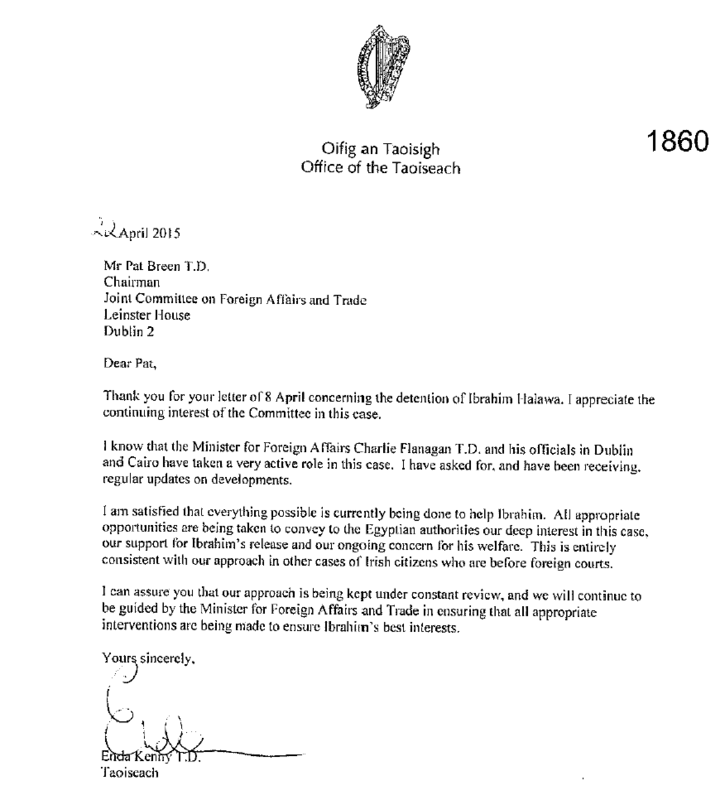 Today we received a response from the Taoiseach’s office acknowledging Ibrahim’s case. 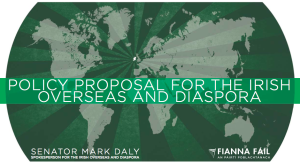 Senator Mark Daly argues that the cancellation of the Intern Work and Travel Program in the United States will negatively affect Irish students that want to go abroad. Recently, I attended an interparliamentary conference in Rome. If the Minister had been there, he would have been disturbed to hear the language coming from our Italian hosts. They were essentially talking about a European army and the ability of Europe to intervene in the same way as the United States intervenes at the moment. They were not talking about having a common defence policy in the short term, but they obviously want to have such a policy in the long term. In addition, they said that we need to gradually create a European army. On 12 September 2013, a European Parliament resolution referred to efforts within the Council to increase the flexibility and usability of battle groups, transfer of authority and removal of national caveats. That would basically remove Ireland’s veto over the deployment of battle groups. That was the language being used not just by the Italians but also by members of other parliaments. I tried to insert language in the communiqué of that conference to mention Irish neutrality and our insistence that there would not be a European army. We have a triple lock mechanism, so we do not and will not deploy our troops unless there is a UN mandate to do so. That was resisted, however. Worse again is talk in the European Parliament about removing Ireland’s national caveat, that is, our veto over the deployment of troops. They were even talking about having a blank cheque, basically, the ability to get a resolution passed for the deployment of troops on undetermined future missions for unspecified causes. I do not know how the European Parliament passed a resolution talking about the transfer of authority and the removal of national caveats, but it certainly did. Chairman: Can we have a question, if the Senator does not mind? Senator Mark Daly: Could the Minister raise that matter with his colleagues in the Council? In future, all language in such resolutions should refer to Irish neutrality, which they refused to insert in that resolution. Senator Daly Commented “This is the most positive news the undocumented Irish have received in years, these steps will allow some of them to finally come out of the shadows and live without the constant fear of deportation. One of the most important things for the undocumented is the right to come home, many have missed countless Christmases, weddings and very distressingly for many families funerals. I support the decision made to have the ‘Hooded Men’ judgement reviewed by the European Court of Human Rights following the RTE’s excellent report highlighting the methods used had a hugely traumatic, debilitating and life-changing effect and that, by any measure, the forms of interrogation used were torture. Senator Mark Daly has called on the Government to provide extra funding to Irish Organisations throughout the United States who will be helping some of those 50,000 Undocumented Irish who qualify under the terms of the President executive order. Senator Daly commented “There are many brilliant organisations throughout the United States such as the ILIR (Irish Lobby for Immigration Reform) Irish Pastoral Centres in Boston, San Francisco and Chicago and the Aisling Centre in New York. These organisation are dealing with countless queries from the Irish community. Their work load has increased enormously in the past few weeks and this will only increase further in the coming months as many of the 50,000 undocumented prepare to come out of the shadows and work with the US authorities to become legal. President Obama himself referenced these people in his speeches, saying “there are Irish in Chicago who do not have their papers in order”, I am calling on the Irish government to provide the essential funding these Irish Organisation will need to help many in the Irish community get their papers in order. Senator Daly will also be pressing the minister of state for the Irish overseas and the diaspora to push the US government for ‘Humanitarian visa’s’ which would allow those not covered by the executive order to travel to Ireland to be with family at time of distress such as a during a bereavement. Senator Mark Daly will force the vote if the government does not support his motion at this weeks Foreign Affairs meeting calling for the Egyptian President to release Ibrahim Halawa, an Irish/Egyptian national, a juvenile of 17 at the time of his arrest. The motion also calls on the Egyptian government to respect its international obligations under The UN Convention on the Rights of the Child. Ibrahim Halawa two sisters will attend the Foreign Affairs committee meeting at 2.30 on Wednesday for the motion and to hear from a Human rights expert about the ongoing Crisis in Egypt. ‘Talk is cheap’ said Senator Daly ‘and visits by Irish officials to the prisons is activity masquerading as action, what this Irish citizen needs is government intervention and action. years at time of arrest, who has been held in detention in Cairo since August 17 2013. The motion also calls on the Egyptian government to respect its international obligations under The UN Convention on the Rights of the Child.